PRESS RELEASE 13 October 2001: NGOs cancel NGO Forum. HAVANA DECLARATION of the GLOBAL FORUM ON FOOD SOVEREIGNTY Havana, Cuba, September 3-7, 2001. For the Peoples' Right to Feed Themselves! Review of 1996 World Food Summit: Beyond the World Food Summit: Can Civil Society Organisations collectively rise to the challenge? We will pursue participatory and sustainable food, agriculture, fisheries, forestry and rural development policies and practices in high and low potential areas, which are essential to adequate and reliable food supplies at the household, national, regional and global levels, and combat pests, drought and desertification, considering the multifunctional character of agriculture. " WFS+5 refers to this year's meeting from 5-9 November 2001, with the NGO forum starting just before and then running in parallel. The NGOs/CSOs will have their own website active soon. All papers will be posted soon on FAO's website. 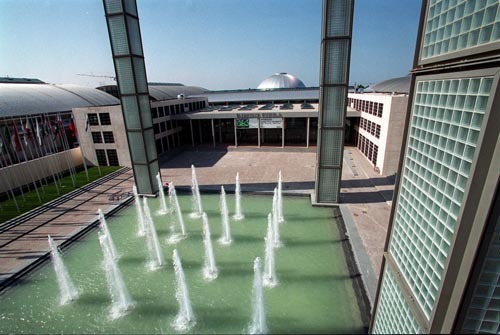 At the IFPRI Vision 2020 Conference which took place at the former German Bundestag building in Bonn from 4 to 6 September 2001 scientists and politicians asked what tools could effectively be used to alleviate hunger in the world. Most put their hopes in high-tech solutions and advocated modern biotechnologies. The invited audience could participate in the discussion mainly by digivote. It turned out that two per cent of the several hundred participants and four per cent of the speakers were farmers  too few by far to speak of an adequate involvement of those affected. But are the concepts proffered by the think tank of international agricultural research and policy really visionary? Is there a glimmer of hope that the Washington offices, the laboratories and the management of multinational corporations in the Life Science industry can come up with the silver bullet for entire regions of the world where every day millions of people go to bed hungry? NGOs from North and South doubt that agricultural policy is really focusing on small farmers. With their knowledge and experience small farmers have the capabilities which have secured food for many centuries and in many places and can still do so today. These capabilities were considered by only a few speakers; some speakers even claimed that they were outdated. The mantra of the market dominated the conference; little room was given to critical questions concerning the deregulation of trade, the fixation on high-tech solutions, and the role multinationals play in the food system. Again, more technical than political solutions were offered to solve the problem of world hunger. - How can a strategy that relies on exports benefit small farmers when protectionist measures close the markets in the North to the products of the poor? - If genetic engineering should have a justification anywhere, then certainly not in the poor rural areas. Why do scientists and politicians first and foremost bank on this controversial technology instead of building on the existing basis and promoting already established and agro-ecologically adapted cultivation techniques? - The use of genetic engineering in agriculture is costly both in the North and in the South because evaluating research into biological safety and the control of compliance with the safety regulations are expensive. Are these foreseeable costs proportional to the controversial benefits? - Who is responsible for a policy which secures food for the rural poor and who contributes to the development of this policy? And finally: To whom are organisations such as IFPRI which design concepts and strategies for worldwide food security accountable? - Small farmers organisations have to be adequately involved in the development of food security policies at the international level. - Food sovereignty and the Farmers Rights to develop seed are human rights which have to be enshrined in international conventions. - Genetic resources must not be privatised. They have to remain in the public domain so that farmers and scientists can develop seed without any restrictions. - The terminator technologies and similar methods that hinder germination of seeds by genetic engineering have to be banned internationally. - Transnational corporations and gene technology will on the one hand contribute very little to alleviate hunger and on the other hand will put burdens on the taxpayers and development aid budgets through the enforcement of safety measures. Gene technology therefore must not become a priority for food security policy. Agro-ecological approaches, that are adequate to the various social, cultural and economic realities specific to the location, today offer the potential for food security. This knowhow must be supported politically and spread by means of appropriate educational and training measures. The International Food Policy Research Institute (IFPRI), Washington, is preparing a conference on "Sustainable Food Security for All by 2020" (Vision 2020) in Bonn, September 4-6, 2001. Many of you may have registered for this conference. It is an event with a strong public awareness character. The German NGO Forum Environment and Development, especially its project group on International Agricultural Research, has analysed the IFPRI plans, together with Deutsche Welthungerhilfe, an NGO co-sponsoring the Vision 2020 Conference, and many international CSOs. This resulted in a number of suggestions being made to IFPRI. And although IFPRI has taken up some of these, i.e. to include the right to food as well as small farming as topics, and the inclusion of a few CSO or ex-CSO resource persons, we still have reservations about the conference programme. We are especially concerned about the very small contributions participants can make. There will be only plenary sessions held - no working groups. Participants may pose questions to panellists, only if there is enough time available. Extremely short breaks (no coffee breaks, an hour lunch break only) further reduce the possibility for an exchange of information and ideas. There will be electronic voting on a set of questions which, for technical reasons, will be prepared in advance. The results of the conference will be summarized by the Vision 2020 Steering Committee; an IFPRI vision document will be presented at the conference. We are also concerned about the weak role foreseen for the UN, especially in view of the upcoming Rome+5 meeting in November where the negotiated target - not a vague vision - to reduce the number of malnourished by 2015, will be reinforced. We are also concerned about the energy IFPRI has applied in the past to promote biotechnology. Although the CGIAR policy at the Midterm Meeting in Durban last month was to avoid the topic, there has been no statement so far that changes IFPRI's position re a very high potential of biotechnology to mitigate malnutrition. The German media have extensively informed on the potential benefits of Golden Rice. In order to enrich the discussion, CSOs feel that they should prepare some accompanying events for the conference participants as well as the press. Lunchtime discussions and leaflets (both in English), a reader (English and German) and press activities are being prepared. Details will follow. In order to include a field visit, we are offering a trip to the urban ecological farm, Gut Ostler, on 3 September. More information will follow. The number of participants is limited to 30; so please do decide soon if you would like to join in on an informative and social event. Since many CSO representatives will be coming to Bonn, we wish to use the opportunity to contribute to the preparations of the international NGO activities on the World Food Summit - Five Years Later (Rome+5) and have therefore foreseen Friday, 7 and Saturday, 8 September. A programme will follow. As the international conference on Food Sovereignty is planned in Havanna, Cuba, during the same week, we make every effort to coordinate preparations and exchange results of the two events. According to the current plans for Bonn, an emphasis will be put on agricultural production models and on access to (genetic) resources. Also, we foresee some emphasis on European coordination of the Rome+5 preparations and make efforts to involve Eastern Europeans. A word on costs. Some of you may have the opportunity to have their participation at the IFPRI conference funded by IFPRI; there is no registration fee, and lunches are free on the three conference days. It is advisable to register immediately with IFPRI. The cheapest accommodation offered by IFPRI is 116 DM/single (+/-100 USD) incl. breakfast; cheaper hotel accommodation is hardly available in Bonn. For CSOs we can offer a limited number of simple rooms with a church organisation located 25 minutes away with a direct tram connection to the venues at about 50 DM/single. We are still working out more possibilities and therefore need your preliminary registration. The field visit is free of charge. Costs re the Rome+5 meeting won't be high; details have not yet been clarified. So far, our travel funding possibilities are limited to resource persons; we keep working on this point. A number of people organized in the Working Group on Food and Agriculture within the German NGO Forum Environment and Development are preparing the CSO activities; we are grateful that the International Steering Committee of the project on International Agricultural Research (including Monica Kapiriri, PELUM; Pat Mooney, RAFI; Patrick Mulvany, ITDG; Ditdit Pelegrina, SEARICE; and Flavio Valente, AGORA) as well as the organizers of the international NGO activities related to Rome+5 are advising us. Further information will be circulated asap. In order to help plan your accommodation it is necessary to have your preliminary registration immediately. A deadline for registration will follow. We look forward to seeing many of you in Bonn! At a meeting in Brussels on 10 October, Jacques Diouf, Director-General of the Food and Agriculture Organization of the United Nations, thanked Romano Prodi, President of the European Commission, for his long-standing support to FAO. He also commended the Commission for its willingness to participate in the effort to contribute to the process of mobilisation of substantive resources to achieve the goal of halving the number of the world's hungry by 2015. The Commission would thus join member countries that have already indicated their willingness to make pledges to this effect. The Director-General underlined the importance of solidarity between developed and developing countries in the fight against hunger and poverty. Dr Diouf informed President Prodi of the discussions with the Italian authorities which have led him to seek the approval of the FAO Council to hold the meetings of 5 to 9 November in Rome instead of in Rimini. The Director-General also indicated that through informal consultations with member countries, he is reassessing the implications of the present international crisis on the planned World Food Summit: five years later. Decisione dell'organizzazione delle Nazioni Unite. Berlusconi conferma: non ci sono più le preoccupazioni per la sicurezza ROMA - Continua il balletto delle sedi per il prossimo vertice Fao. Doveva essere a Rimini, ora torna a Roma, la sua sede originaria. La decisione, come è stato reso noto questa mattina dalla Organizzazione dell'Onu per l'alimentazione e l'agricoltura, è stata presa la scorsa notte nel corso di una riunione tra il direttore Jacques Diouf e il governo italiano. La conferenza, in un primo momento programmata nella capitale, era stata poi trasferita a Rimini per motivi di ordine pubblico. Si svolgerà dal 5 al 9 novembre, attesi quattromila delegati da tutto il mondo. BERLUSCONI - Silvio Berlusconi ha confermato che il vertice Fao di novembre si terrà a Roma: «È la Fao che decide - ha speigato il presidente del Consiglio a Bruxelles - e noi abbiamo detto che per noi andava bene. Crediamo che le preoccupazioni di sicurezza che avevamo prima dell'11 settembre ora non ci siano più». CONSIGLIO FAO - In verità, la scelta di Roma non è una ancora sicura. Fonti della Fao hanno precisato che la decisione scaturita dalla riunione della scorsa notte tra Diouf e il governo italiano è stata quella di non tenere il vertice a Rimini. Sarà il consiglio della Fao a stabilire se riportare il vertice nella sede originariamente prevista, ossia a Roma, o se optare per diverse decisioni. The Food and Agriculture Organization of the United Nations announced today that following consultations with the Italian Government, it was now seeking the agreement of members of the FAO Council to transfer back to Rome the different meetings of the Organization which were envisaged to take place in Rimini. Last week, it was announced that the FAO Council had accepted a proposal from the Italian Government to move out of Rome the part of the FAO Conference from 5 to 9 November 2001, which includes the World Food Summit: five years later and related events. After considering several alternate locations, the Italian government had proposed that the meeting be moved to Rimini. The proposal was then submitted to the 49 member countries of the FAO Council. The World Food Summit: five years later was called for by the FAO Council last year when it became clear that the original Summit goal of cutting the number of hungry in half by the year 2015 would not be met without renewed effort. It has just been announced that the FAO Council has decided to accept the Italian government's instructions to hold the World Food Summit outside of Rome. It will take place from 5-9 November in Rimini (travel to and from Rimini will be on 4th and 10th November). The FAO conference will be held in parallel, having started in Rome on 2nd November and ending in Rome on 13th November. The negotiations on the International Undertaking will be held in the FAO Council from 30th October to 1st November - perhaps in a 6 session parallel Open-ended Working Group. This might even continue beyond 1st November, if circumstances dictate. The FAO Conference will debate/endorse the IU, probably during its week in Rimini or when it returns to Rome. Genetic resources and wider Agricultural Biodiversity issues will thus form a key focus of discussions both in Rome and Rimini and CSOs/NGOs and Farmers' Organisations should make most of this opportunity. Clear messages are needed from Rome to the WTO Ministerial meeting and subsequent trade meetings on TRIPs and Agriculture as well as environmental and sustainable development negotiations in the CBD and in preparation for Rio+10. In the present climate of insecurity and uncertainty it may left to CSOs to transmit these messages. The delays in agreement on venue will inevitably lead to lower attendance by Heads of State. Many FAO staff will be unavailable in Rimini which will reduce our opportunity to interface with them and media attention is elsewhere. However, we will make an, albeit lower key, attempt to raise the issues and ensure that, to the extent possible, the plant genetic resources for food and agriculture that are essential for food security and interdependence are kept in the public domain. If you want to keep abreast of the arguments, arrangements and outcomes, go to <www.ukabc.org> and follow the links to the International Undertaking and World Food Summit: five years later. Postponement would have been the sane option. Yesterday the Italian government officially proposed Rimini as the location for the FAO summit on world hunger. But within the UN agency, there is still much discussion on the advisability of holding the summit. After the terrorist attacks of September 11 in the United States and in view of a military response, several countries have expressed concern over a gathering of heads of state from the 185 nations that make up the Food and Agriculture Organization. The Italian Government has formally proposed to the UN Food and Agriculture Organization (FAO) that the World Food Summit: five years later should be held in the Adriatic resort town of Rimini from 5 to 9 November 2001, FAO said today. In a letter addressed to FAO Director-General, Dr. Jacques Diouf, from the Prime Minister's office, the Italian Government expressed its willingness to bear the additional financial costs resulting from the move of the Summit to Rimini. Italy proposed that an agreement should be signed with FAO in this respect. The Italian proposal has been forwarded to the members of the FAO governing Council. A decision is expected by the beginning of next week. The purpose of the World Food Summit: five years later is to review the progress made towards the eradication of hunger and to raise both the political will and the financial resources to accelerate the fight against hunger. At the World Food Summit in 1996, representatives of 185 nations and the European Community pledged to work towards eradicating hunger. As an essential first step, they set a target of reducing the number of hungry people - still more than 800 million - by half by 2015. Unfortunately, current data indicate that the number of undernourished is falling at a rate of only 8 million each year, far below the average rate of 20 million per year needed to reach the World Food Summit target. Although headway has been made and some striking success stories exist in individual countries and communities, much remains to be done, FAO said. Rome, 17 September 2001 - Undernourishment and starvation should not be considered less serious than blatant violations of other human rights, according to a statement by UN Food and Agriculture Organization (FAO) Director-General Jacques Diouf. "The State has the obligation, as an instance of last resort, to ensure that nobody should die of hunger. The international community is called upon to assist those States that do not have the means to ensure minimum access to food for all their people through complementary measures." Mr. Diouf's statement was delivered by Hartwig de Haen, FAO Assistant Director-General, Economic and Social Department, at the Jacques Maritain Seminar on the right to food. In the remarks, he said: "The World Food Summit not only reaffirmed the right to adequate food, but also explicitly recognized the crucial link between food security and democracy and civil and political rights as part of the enabling environment that is necessary for the full enjoyment of the right to food. It is well known that in the presence of hunger, the ability to exercise other human rights is severely hampered." The FAO message added:"We know that there is enough wealth in the world to ensure a minimum standard of living for everyone and we should devote our joint efforts to the rights of the poor to a free and dignified life, of which adequate food is fundamental." Addressing the many armed conflicts around the globe, FAO said, "the deliberate starvation of civilians and the use of food as a method of warfare are forbidden under the Geneva Conventions and are an obvious violation of the right to food. So is blocking humanitarian assistance and failing to come to the assistance of people in dire need. But the failure to address the silent undernourshment of millions of children and adults in peacetime should also be regarded as a violation of the right to food." The FAO statement warned, "The scandal of hunger merits more outrage than it is getting, not only on moral grounds, but because it is a human rights violation on a massive scale." He called on agencies and organizations dealing with humanitarian assistance and development to "urgently address and seek to redress violations of the right to food." At a news conference held at FAO headquarters in Rome on 3 September, FAO Director-General Jacques Diouf said that the organization could consider the feasibility of moving the World Food Summit: five years later, scheduled for 5-9 November, but excluded any possibility of postponing the meeting. The statement came after a lunch meeting between Mr Diouf and Italian Prime Minister Silvio Berlusconi, who conveyed the Italian Government's request that the summit be moved, amid fears that it might attract protests like those that struck the G8 summit in Genoa in July. "Such a decision would have to be taken in accordance with the rules and procedures of the organization," said Mr Diouf. "However, we are open to study whatever alternative location would be proposed by the Government of Italy and the feasibility of such alternative proposals in relation to our objective of ensuring that the Summit will be a success." Mr Diouf announced that a technical team composed of representatives from FAO and the Government would study the logistical aspects of such a move and would consider alternative venues that could meet the needs of such a large gathering. All heads of state have been invited to attend the meeting, a follow-up to the World Food Summit in 1996, where representatives of 185 nations and the European Community pledged to reduce the number of hungry people by half by 2015. At the November meeting participants will review progress made towards that goal and consider ways to accelerate the process. Italy has shocked a major United Nations agency by saying it wants to switch a world food summit from Rome to Africa because it believes Western governments cannot contain violent anti-globalisation activists. Prime Minister Silvio Berlusconi has decided it is too risky to host the Food and Agricultural Organisation's November summit, expected to draw representatives from 185 countries. He is reported to have said that anarchists who turned Genoa into a war zone during last month's G8 meeting could inflict even more damage on Rome's monuments and reputation. Berlusconi is not alone in his dilemma. Canadian Prime Minister Jean Chretien decided that next June's Group of Eight summit in Canada should be held in Kananaskis, a remote mountain resort in Alberta that will be relatively easy to defend. Critics accused Berlusconi of surrendering the authority of the state to a few thousand extremists who could now claim victory over the rule of law. No formal announcement has been made but, according to leaks from a meeting last week, the Prime Minister said he could not afford another public relations calamity of riots and police brutality. 'Too risky, we will move the summit to the Third World,' he said, and promised to cover the cost of switching at such short notice. The Foreign Ministry is understood to be contacting African governments with the official line that a summit about hunger should be held in a developing country. Italian media suggested Kenya was the likeliest host. A spokesman for Berlusconi yesterday declined to confirm or deny the reports. The FAO is one of the UN's biggest agencies and has been based in Rome for half a century. The four-day summit, scheduled to start on 5 November, was called to review progress in its goal of halving the number of hungry people by 2015. Websites of the hardline Black Bloc anarchists, who caused havoc at the G8 despite 18,000 police, said Rome was the next target. Violence in Genoa left one dead, more than 300 injured and the government's reputation in shreds. Peaceful activists such as the Frenchman Jose Bove have also identified Rome as the anti-globalisation movement's next rallying point. Relocating the summit away from the headquarters would be too expensive and effectively force its cancellation, said one source. Opposition politicians savaged the Italian proposal as an admission that the state could no longer guarantee public order. Forty-nine people remain in detention and eight investigations are under way following the clashes in Genoa, a prosecutor announced. From September 3 to 7, 2001, some 400 delegates from peasant and indigenous organizations, fishing associations, non-governmental organizations, social agencies, academics and researchers from 60 countries around the world met in Havana, Cuba at the World Forum on Food Sovereignty. This Forum was convened in Cuba by the Cuban National Association of Small Farmers and a group of international movements, networks, organizations and people committed to peasant and indigenous agriculture, artisanal fisheries, sustainable food systems and the peoples' right to feed themselves. It also serves as recognition of the efforts of a Third World country which, despite suffering over four decades of the illegal and inhuman blockade imposed by the United States and the use of food as a weapon of economic and political pressure, has managed to guarantee the human right to nutrition for all of its population by way of a coherent, active, participatory and long-term state policy based on profound agrarian reform, appreciation and support for small and medium-sized producers, and the participation and mobilization of the entire society. We gathered to analyze the reasons why hunger and malnutrition grow every day throughout the world, why the crisis in peasant and indigenous agriculture, artisanal fisheries and sustainable food systems has worsened, and why the peoples are losing sovereignty over their resources. Likewise, we gathered to collectively develop, from the perspective of the peoples and not the transnational food corporations, viable proposals, alternatives and strategies for action on a local, national and global scale, aimed at reversing current trends and promoting new focuses, policies and initiatives that can guarantee a dignified and hunger-free present and future for all the men and women of the world. Five years after the World Food Summit, seven years after the agricultural agreements of the GATT (now WTO) Uruguay Round, and following two decades of the application of neoliberal policies by a large part of governments, the promises and commitments made to satisfy the food and nutritional needs of all are far from being fulfilled. On the contrary, the reality is that the economic, agricultural, fishing and trade policies imposed by the World Bank, IMF and WTO, promoted by the transnational corporations, have widened the gap between the wealthy and poor countries and accentuated the unequal distribution of earnings within countries. They have worsened the conditions of food production and access to healthy and sufficient nutrition for the majority of the world's peoples, even in the so-called developed countries. As a consequence, the most basic human right of all, the right to food and nutritional well-being enshrined in the Universal Declaration of Human Rights, is not guaranteed to the majority of the world's peoples. The sustainability of food systems is not merely a technical matter. It constitutes a challenge demanding the highest political will of states. The profit motive leads to the unsustainability of food systems by surpassing the limits on production allowed by nature. The sustainability of food systems is not viable within the current trade system and the context of liberalization promoted by the WTO and international financial organizations. The hope for a new millennium free of hunger has been frustrated, to the shame of all humanity. The real causes of hunger and malnutrition Hunger, malnutrition and the exclusion of millions of people from access to productive goods and resources, such as land, the forests, the seas, water, seeds, technology and know-how, are not a result of fate, of happenstance, of geographical location or climatic phenomena. Above all, they are a consequence of determined economic, agricultural and trade policies on a global, regional and national scale that have been imposed by the powers of the developed countries and their corporations for the purpose of maintaining and increasing their political, economic, cultural and military hegemony within the current process of global economic restructuring. - We affirm that food is not just another merchandise and that the food system cannot be viewed solely according to market logic. - We consider as fallacious the argument that the liberalization of international agricultural and fishing trade guarantees the people's right to food. - Trade liberalization does not necessarily facilitate the economic growth and well-being of the population. - The underdeveloped countries are capable of producing their own food and could be capable of doing so in the future. - The neoliberal concept of comparative advantages severely affects food systems. In keeping with this concept, the importing of basic food commodities leads to the dismantling of domestic production, given the possibility of buying them "cheaper" from the wealthy countries. This in turn leads to the reorientation of their productive resources towards export crops that are "more competitive and have greater value added" for the First World markets. It is a lie that countries should not be concerned with establishing and implementing state policies to guarantee food security for their citizens. Neoliberal theorists argue that the global supermarket of exporter countries can satisfy any demands with no problems whatsoever. - They try to deceive the population when they claim that peasant and indigenous farmers and artisanal fisheries are inefficient and unable to meet the growing needs for food production. They use this claim in the attempt to impose widescale, intensive industrial agriculture and fishing. - We denounce as false the argument that the rural population is overly large in comparison with its contribution to the gross domestic product. In reality, this reflects an attempt to brutally expel the rural population from its lands and fishing communities from the coasts and seas, privatizing natural resources. - We reject the use of widescale, intensive industrial agriculture and fishing as the means to confront the world's growing food needs. - They attempt to convince us that the only alternative for peasants, fishers and indigenous peoples is to give way to the privatization of their lands and natural resources. This leads, among other effects, to massive migration to the cities and abroad in order to expand the supply of cheap labor needed to increase the "competitiveness" of the dynamic sectors of national economies linked to exports and transnational corporations. At the same time, unemployment and the loss of jobs are on the rise in the developed countries. - There is an attempt to impose the food model of the transnational corporations as the only viable, appropriate and correct model in a global world. This is veritable food imperialism, which threatens the diversity of the peoples' food cultures and their national, cultural and ethnic identities. - In this context, the hegemonic powers use food as a weapon of political and economic pressure against sovereign countries and popular resistance movements. - All of the above is taking place within the framework of the systematic weakening of states and the promotion of false democracies that systematically disregard the public interest and real participation of society in general and the rural population in particular in the discussion, design, adoption, implementation and control of public policies. The consequences of neoliberal policies and the consequences of these false and erroneous policies are visible: they have increased the sales and profits of the economic powers of the developed countries, while the peoples of the Third World have seen the growth of their external debt and heightened levels of poverty, extreme poverty and social exclusion. The concentration of the international agricultural market within a number of transnational corporations has been accelerated, while the dependence and food insecurity of the majority of peoples has increased. There continue to be heavy subsidies for export agriculture and fishing, at the same time that many governments provide absolutely no protection for small and medium-sized producers who produce mainly for the domestic market. Policies of production and export subsidies in the developed countries allow the transnationals to acquire products at very low prices and sell them at much higher prices to consumers in both the South and the North. Neoliberal policies towards the countryside have in fact promoted a process of forced deruralization of vast proportions and dramatic consequences, a genuine war against peasant and indigenous agriculture, which in some cases has come to constitute veritable genocide and ethnicide. Artisanal fishing communities have been increasingly losing access to their own resources. 1. Food sovereignty is the means to eradicate hunger and malnutrition and to guarantee lasting and sustainable food security for all of the peoples. We define food sovereignty as the peoples' right to define their own policies and strategies for the sustainable production, distribution and consumption of food that guarantee the right to food for the entire population, on the basis of small and medium-sized production, respecting their own cultures and the diversity of peasant, fishing and indigenous forms of agricultural production, marketing and management of rural areas, in which women play a fundamental role. 2. Food sovereignty fosters the economic, political and cultural sovereignty of the peoples. 3. Food sovereignty recognizes agriculture involving peasants, indigenous peoples and fishing communities with links to the territory; primarily oriented towards the satisfaction of the needs of the local and national markets; agriculture whose central concern is human beings; agriculture which preserves, values and fosters the multifunctionality of peasant and indigenous forms of production and management of rural areas. Likewise, food sovereignty entails the recognition and appreciation of the economic, social, environmental and cultural advantages of small-scale, family-based, peasant and indigenous agriculture. 4. We consider the recognition of the rights, autonomy and culture of indigenous peoples in all countries as an imperative requisite for combating hunger and malnutrition and guaranteeing the right to food for the population. Food sovereignty implies the recognition of the multi-ethnicity of nations and the recognition and appreciation of the identities of aboriginal peoples. This implies, as well, the recognition of autonomous control of their territories, natural resources, systems of production and management of rural areas, seeds, knowledge and organizational forms. In this sense, we support the struggles of all of the indigenous peoples and peoples of African descent in the world, and demand full respect for their rights. 5. Food sovereignty further implies the guarantee of access to healthy and sufficient food for all individuals, particularly for the most vulnerable sectors, as an imperative obligation for national governments and the full exercise of civil rights. Access to food should not be viewed as a form of assistance from governments or of charity from national or international public or private entities. 6. Food sovereignty implies the implementation of radical processes of comprehensive agrarian reform adapted to the conditions of each country and region, which will provide peasant and indigenous farmers - with equal opportunities for women - with equitable access to productive resources, primarily land, water and forests, as well as the means of production, financing, training and capacity building for management and interlocution. Agrarian reform, above all, should be recognized as an obligation of national governments where this process is necessary within the framework of human rights and as an efficient public policy to combat poverty. These agrarian reform processes must be controlled by peasant organizations - including the land rents market - and guarantee both individual and collective rights of producers over shared lands, as articulated in coherent agricultural and trade policies. We oppose the policies and programs for the commercialization of land promoted by the World Bank instead of true agrarian reforms accepted by governments. 7. We support the proposal put forward by civil society organizations in 1996, calling for states to draw up a code of conduct on the human right to adequate food, to effectively serve as an instrument for the implementation and promotion of this right. The peoples' right to food is included in the Declaration of Human Rights and was ratified at the World Food Summit in Rome in 1996 by the member states of the United Nations Food and Agriculture Organization (FAO). 8. We propose the most rapid ratification possible and application by a larger number of countries of the International Covenant on Economic, Social and Cultural Rights, adopted by the United Nations General Assembly in 1966. 9. In defense of the principle of the people's inalienable right to food, we propose the adoption by the United Nations of an International Convention on Food Sovereignty and Nutritional Well-Being, which should rule over decisions adopted in the fields of international trade and other domains. 10. International food trade should be subordinated to the supreme purpose of serving human beings. Food sovereignty does not mean autarchy, full self-sufficiency or the disappearance of international agricultural and fishing trade. 11. We oppose any interference by the WTO in food, agriculture and fishing and its attempt to determine national food policies. We categorically oppose its agreements on intellectual property rights over plants and other living organisms, as well as its intention to carry out a new round of negotiations (the so-called Millennium Round) including new themes for negotiation. Keep the WTO out of food. 12. We propose the creation of a new democratic and transparent order for the regulation of international trade, including the creation of an international appeals court independent of the WTO and the strengthening of UNCTAD as a forum for multilateral negotiations on fair food trade. At the same time, we propose the promotion of regional integration schemes among producers' organizations, unrelated to neoliberal goals and parameters. 13. We demand an immediate end to dishonest practices that establish market prices below production costs and provide subsidies for production and exports. 14. We oppose the FTAA, which is nothing more than a hegemonic strategic plan developed by the United States to consolidate its control over Latin America and the Caribbean, expand its economic borders, and guarantee itself a large captive market. 15. We support the demands made by peasant and social organizations in Mexico for the suspension of the NAFTA agreements concerning agriculture. 16. Genetic resources are the result of millennia of evolution and belong to all of humanity. Therefore, there should be a prohibition on biopiracy and patents on living organisms, including the development of sterile varieties through genetic engineering processes. Seeds are the patrimony of all of humanity. The monopolization by a number of transnational corporations of the technologies to create genetically modified organisms (GMOs) represents a grave threat to the peoples' food sovereignty. At the same time, in light of the fact that the effects of GMOs on health and the environment are unknown, we demand a ban on open experimentation, production and marketing until there is conclusive knowledge of their nature and impact, strictly applying the principle of precaution. 17. It is necessary to promote widespread dissemination and appreciation of the agricultural history and food culture of every country, while denouncing the imposition of food models alien to the food cultures of the peoples. 18. We express our determination to integrate the goals of nutritional well-being into national food policies and programs, including local productive systems, promoting their diversification towards foods rich in micronutrients; to defend the quality and safety of foods consumed by populations; and to fight for the right of all individuals to information on the foods they consume, by stepping up regulations on food labels and the content of food-related advertising, exercising the principle of precaution. 19. Food sovereignty should be founded on diversified systems of production, based on ecologically sustainable technologies. It is essential to develop initiatives for sustainable food production and consumption generated at the local level by small producers, with the establishment of public policies that contribute to building sustainable food systems around the world. 20. We demand the justly deserved appreciation of peasant, indigenous and fishing communities for their sustainable and diversified management of rural areas, through appropriate prices and incentive programs. 21. When addressing the problem of food on a worldwide scale, we must take into account the cultural diversity that leads to different local and regional contexts, because the protection of the environment and biodiversity are closely related to the recognition of cultural diversity. 22. The development of sustainable food systems must include nutritional considerations, such as the demand for the regulation of the handling of agrotoxins. 23. We recognize and appreciate the fundamental role played by women in the production, harvesting, marketing and preparation of the products of agriculture and fishing and in passing on the food cultures of the peoples. We support the struggles waged by women for access to productive resources, and for their right to produce and consume local products. 24. Artisanal fishers and their organizations will not relinquish their rights to free access to fishing resources and the establishment and protection of reserve areas for the exclusive use of artisanal fishing methods. Likewise, we demand recognition of ancestral and historic rights over the coasts and inland waters. 25. Food aid policies and programs must be reviewed. They should not be an inhibiting factor for the development of local and national food production capacities, nor should they foster dependence, the distortion of local and national markets, corruption, or the dumping of foods that are harmful to health, particularly with regard to GMOs. 26. Food sovereignty can only be achieved, defended and exercised through the democratic strengthening of states and the self-organization, initiative and mobilization of all of society. It requires long-term state policies, an effective democratization of public policies, and the development of a solidarity-based social setting. 27. We condemn the U.S. policy of blockading Cuba and other peoples and the use of food as a weapon of economic and political pressure against countries and popular movements. This unilateral policy must end immediately. 28. Food sovereignty is a civil concept that concerns society as a whole. For this reason, social dialogue should be open to all the social sectors involved. 29. Achieving food sovereignty and eradicating hunger and malnutrition are possible in all countries and for all peoples. We express our determination to continue struggling against neoliberal globalization, maintaining and increasing active social mobilization, building strategic alliances and adopting firm political decisions. * Declaring October 16 as World Food Sovereignty Day, known until now as World Food Day. * Demanding that the World Food Summit Five Years Later go ahead as planned from November 5 to 10 of this year, and that the FAO fully assume its mandate and responsibility. Social organizations should organize events at the national and continental level to promote their proposals and pressure official delegations. * Demanding that the Italian government fully respect the freedom to demonstrate and refrain from repressing social movements opposed to neoliberal globalization.